Whether you are looking to host a business meeting, wedding reception, rehearsal dinner, or any other special event in Kansas City, The Majestic Restaurant is your definitive destination. With over 100 years of history, The Majestic Restaurant is the ideal place to add to your special occasions. From the comfort of The Pendergast Club to the classic feel of The Jazz Club to the elegance of The Main Dining Room, The Majestic Restaurant has the perfect room for your group. With classic Kansas City steaks, hand crafted cocktails, and one of the best wine lists in Kansas City, you can trust that the staff of The Majestic Restaurant will do their best to make your event a success. 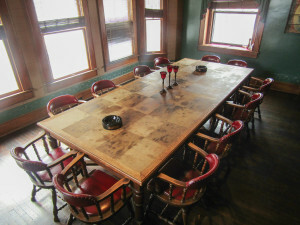 The private dining rooms at The Majestic Restaurant are in high demand. We recommend you contact us as soon as you have set a date so we can reserve the space for your event and start working on making your vision a reality. To do this, please contact us by phone at (816)221-1888 or via email at lacey@majestickc.com.